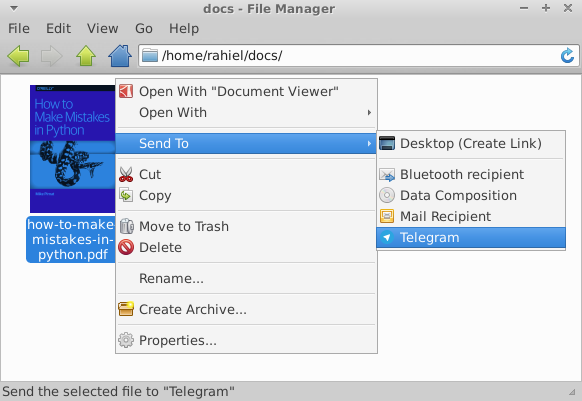 Telegram-send is a command-line tool to send messages and files over Telegram to your account, to a group or to a channel. It provides a simple interface that can be easily called from other programs. There is a maximum message length of 4096 characters, larger messages will be automatically split up into smaller ones and sent separately. telegram-send --format markdown "Only the *bold* use _italics_"
telegram-send --format html "<pre>fixed-width messages</pre> are <i>also</i> supported"
For more information on supported formatting, see the formatting documentation. With this option you can send the output of any program. telegram-send --image photo.jpg --caption "The Moon at night"
If installed for a single user you need to add ~/.local/bin to their path, refer to this guide for instructions. And finally configure it with telegram-send --configure if you want to send to your account, telegram-send --configure-group to send to a group or with telegram-send --configure-channel to send to a channel. Use the --config option to use multiple configurations. For example to set up sending to a channel in a non-default configuration: telegram-send --config channel.conf --configure-channel. Then always specify the config file to use it: telegram-send --config channel.conf "Bismillah". Here are some examples to get a taste of what is possible with telegram-send. And then use it like sleep 10; tg. This will send you a message with the completed command, in this case sleep 10. What if you started a program and forgot to set the alert? Suspend the program with Ctrl+Z and then enter fg; telegram-send "your message here". To automatically receive notifications for long running commands, use ntfy with the Telegram backend. We can combine telegram-send with cron to periodically send messages. Here we will set up a cron job to send the Astronomy Picture of the Day to the astropod channel. Create a bot by talking to the BotFather, create a public channel and add your bot as administrator to the channel. You will need to explicitly search for your bot’s username when adding it. Then run telegram-send --configure-channel --config astropod.conf. We will use the apod.py script that gets the daily picture and calls telegram-send to post it to the channel. Make sure the file ends with a newline. Cron will then execute the script every day at 1:00 as the user telegram. Join the astropod channel to see the result. Supervisor controls and monitors processes. It can start processes at boot, restart them if they fail and also report on their status. Supervisor-alert is a simple plugin for Supervisor that sends messages on process state updates to an arbitrary program. Using it with telegram-send (by using the --telegram option), you can receive notifications whenever one of your processes exits. Because telegram-send is written in Python, you can use its functionality directly from other Python programs: import telegram_send. Look at the documentation. The command is chronic ~/script.bash 2>&1 | telegram-send -g --stdin. We run the cron job with chronic, a tool from moreutils. Chronic makes sure that a command produces no output unless it fails. No news is good news! If our script fails, chronic passes the output through the pipe (|) to telegram-send. We also send the output of stderr by redirecting stderr to stdout (2>&1). Here we’ve installed telegram-send system-wide with sudo and use the global configuration (-g) so telegram-send is usable in the cron job. Place the cron job in /etc/cron.d/ and make sure the file ends with a newline. The filename can’t contain a . either. If you installed telegram-send with sudo, you also need to install pysocks with sudo.